I found this on the web a little while ago and it brought back a few memories, courtesy of the website of Mr Ambrose- Jones, who joined as the replacement Chief Officer. 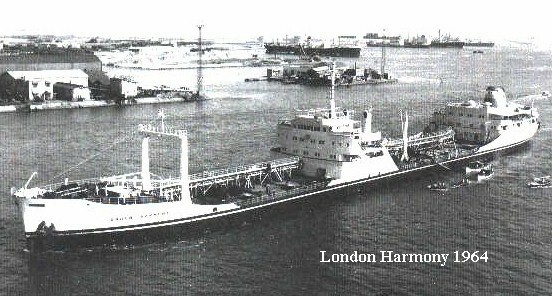 I joined the London Harmony as an apprentice deck officer at the tender age of seventeen. As apprentices we worked with the crew for most of the time, which didn’t make it the most comfortable place to be on the ship when the crew mutinied. It did, however, rapidly improve my observational powers when walking around on the main deck alone. As background to this incident it should be noted that the Ship’s Agent had when engaging the crew in Hong Kong promised them a very high rate of pay. Therefore they signed on with great expectations. They had been on board a short while when they discovered the rate of pay was normal i.e. lower than promised, as if the Ships Agent had promised them normal pay and overtime as basic. The crew on realising their mistake took exception and protested in a progressively aggressive manner. Ultimately threatening to kill both the Captain and the Chief Officer, although I knew both the Captain and Chief Officer to be extremely competent man managers because I had sailed with them previously. The company were unwilling to repatriate the crew. The Captain and Chief Officer were in fear of their lives and requested the shipping line to discharge them from the ship at the first available port. On 19th December Captain Morton joined the London Harmony at the Isle of Grain. It had been a hurry up instruction to join and we wondered what it was all about as we were relieving Captain Lothian Clark and I was relieving John Clark, both of whom we had sailed with before and for whom we had a great respect. The reason which they have given us for leaving the ship was that they were both in fear of their lives and as neither was an alarmist we were surprised, especially when we heard that it was the deck crew who were causing the trouble because I knew John Clark to be a fair man. Within seventy two hours of our leaving the Isle of Grain a round robin was given to me for forwarding to Hong Kong demanding repatriation. From the commencement we had trouble over lookouts, the crew demanded overtime and time off, then the argument was reversed and no overtime was wanted just time off.After considerable difficulties including cables to Hong Kong and LOF the crew accepted Captain’s orders that lookouts were necessary and would be done pro-tem, until we arrived in the UK and the shipping master seen . Crew told two gangs (six hours each) work then night one and a half hours lookout no overtime. 09.00 hours crew were told the above and they demanded overtime. 12.00 hours tank cleaning running forty minutes hour late told one gang forty minutes Overtime work = 1 hour overtime pay they said that they were not going to do more that six hours work but the did in the end. (4 men) crew refused to put gangway away even though they were on paid overtime. For this refusal they were logged five days pay and they said that they would jump ship after Milazzo and their comment was duly logged. All sailors (8 men) took three hours 0.800 to 11.00 to put down the aft ropes. Bosun’s crowd told to turn out for first tank cleaning watch they refused, when ordered again they said they wanted to alternate night work, in this case 14.00 to 19.30 hours tank cleaning. Then two minutes later demanded always to have first tank cleaning watch (No 15 threatened me “You die soon” he had threatened John Clark in the same manner. Frequent trouble over lookout refusing to report numbers ring bell back to acknowledge hearing lookouts signal. Chinese sailors numbers 12 and 13 had a fight and numbers 12, 14 and 15 would not do their lookout duty so that all lookout duty had to be done from the monkey island.My report to the company used such terms as the sailors were obstructive, arrogant and aggressive. When I was half in and half out of a manhole into a fresh water tank one of the sailors (no 10) had stuck a knife into my ribs, not hard just to make a point. He was at that time screaming and quite puce in colour so there was no point in moving, just remain stationary and with a smile say “Don’t get upset it will all be the same in ten years time, you will wonder why you were so upset”. It was about this time that I was reminded how the previous Chief Officer John Clark had decided to keep his cabin door locked when he went to sleep. I decided I would not change the normal habit of leaving the door open and only leaving the curtain across the door. My logic was that you could be jumped as you came out of your cabin at 03.45 hours or at any time on the way up to the bridge, but in my case the crew might think it was unsporting to jump someone who did not even close the door on you! Coming into Cowes Roads anchorage the Bosun said to the Captain “Scrub the fines, gives us subs, and unlimited canteen and there would be no trouble”. This was said in front of the pilot who leaked the story to the media. Ship came alongside at Hamble and the immigration told the Bosun and sailors that there would be no shore leave for them, they laughed and within twenty minutes all of them were on the jetty complete with their belongings. The Bosun was five minutes late as he had stopped for a wash and brush up first. The Police were informed and met the sailors at the gate. Two of the Police came to the ship to find out what sort of crowd the sailors were, violent or otherwise. To the Police the sailors only appeared to be inclined to violence if they were forced to come back to the ship. The sergeant wanted to know how many spoke English and they were told and also that No 10 could speak a lot more than he let on. The Daily Telegraph said only one man could speak ten per cent English, so much for accurate reporting. They also said that the dispute was over pay. Actually it was not even mentioned, during the last month or more overtime was last mentioned after Sunderland. The Police then took the Bosun and sailors to Eastleigh Police Station the to Winchester gaol overnight. LOF Superintendent Markham boarded and asked me how I felt about sailing with the sailors again and in view of what they had said I said “Definitely no- I would not sail with them, as we were forcing them to do something stupid like killing Captain Morton or me”. The Immigration said that “They would bring the sailors back to the ship one hour before sailing without the sailors being willing to come”. Markham was putting them on board and there was nothing we could do about it because we had signed on, and this was after Captain Morton had told him that if the crew was put on board anything could happen! Spontaneously nine officer who were seen by Captain Morton said that they did not want to sail under these circumstances. Captain Markham asked me if I would sail with a full replacement of the Chinese crew with apprentices who were on leave in the UK. I then replied that I would be very happy to sail with such a crew, but the availability of apprentices was never tested in fact. The Chinese crew were brought by coach from Winchester prison, but they would not disembark until they had spoken with me, not with anyone else. I had to take a deep breath when boarding the coach to speak to a crowd who were not happy and for whom I had only bad news. So here goes, don’t fool about, go right into the bus so that all can hear you say “You are not getting what you have asked for”. I thought there could have been a riot but they neither said nor did anything too dramatic.They came back on board with the promise that they would be relieved at Bahrain the next port, according to Captain Markham. Captain Markham had guaranteed that we were going to Bahrain, but we later found out that when he told us and the Union man the ship was in fact stemmed for the Mediterranean and only later were the orders changed to the Persian Gulf. Any change of orders if it did not result in an immediate relief for the sailors could have resulted in a bloodbath! I told the Union man my story and we, including the Captain, went to see Captain Markham who said categorically that we had to sail as we had signed on, but he cooled down and agreed that under similar circumstances he would have done nothing other than what we had done and that after all he would try to get a relief for me. All very well but I had earlier heard Captain Markham threaten Captain Morton with the loss of his job and all his pension rights, so in the end Captain Morton sailed, but he gave me a copy of the log book and other documents should the crew or the company be the death of him physically, or his career. While this was going on, and when the crew were in goal I was called to the jetty and a chap started to ask questions about when we would finish cargo and where were the crew and only after a little while did I twig that he was holding his hand a funny way. It turned out that he was a Daily Telegraph reporter with a tape recorder mike in his cupped hand. The incident was also on the local TV network. I was in fact relieved and when on Southampton railway station was accosted by another reporter looking for an update on why I was leaving the ship and what was happening on the ship today, he was told no comment. Exciting times that I had quite forgotten about. Your account doesn’t surprise me. Mainland Chinese agents and resident sympathisers were routinely working hand-in-hand to make life difficult for colonial authorities. After all, instigation and fomenting discontent have been hallmarks of Communism from the start. It would hardly be surprising if one or two of the Chinese crew members were tied to the CCP. So, JL, you are an old salt? PS Pls shorten the post with the ‘read more’ thingy! London and Overseas ran a fleet of London registered vessels but were into all sorts of “odd” cargoes. They were one of the shipping companies running some very long and thin wooden crates labelled as “Agricultural equipment” from Odessa to Havana that upset JFK so much. Another one of their ships, the “London Citizen,” had a very lucky escape when she got a shell through the for’deck while delivering a cargo of arms to Vietnam. The basic payment that one received could be considerably enhanced by various bonuses. If you “signed on” in the UK for instance, you received an “east of Suez” bonus if you went through the said canal. War zone area was another big increase in percentage terms, so heaven knows who promised what and to whom in this situation. I sailed with a couple of Chinese crews and they were fine, better than your average British crew. However one way to piss a Chinaman off would be to promise him more pay than he was actually going to get. I presume the company was London and Overseas Freighters (LOF) aka London Greeks…? Correct Jazz. When I first joined the company was rapidly expanding and my first ship the “London Banker” (who would christen a ship with that name now?) was brand new and my first two months “at sea” were spent living in a hotel in Vlissingen prior to handover. As a sixteen year old, coming from a little village in Cornwall, I thought I’d died and gone to heaven. Were you oil or water? I am a land-lubber, viewing the sea with a romantic eye but suffering from mal de mer whenever risking a serious voyage. Hats off to salts! I rather think there was a deal sight more trouble at sea than was ever reported. I had a boyfriend who was 2nd/1st officer on a tanker from the Shell fleet. The stories were hair curling, one guy ran amok with a fire axe one night and hacked all the officers doors trying to kill them! I suppose they had had the foresight to lock them! He was away for months at a time so the rest of the time I used to go out with an airline pilot, they dovetailed quite nicely! Always had to prompt the parents who was calling for me as the old man had the unfortunate habit of calling them the wrong name on the doorstep. Oops! the seafarer rather did for himself by writing and telling me that “he had caught the clap from a whore in Hull before boarding”. I wrote back telling him that was that! Please don’t bother! He was terribly civilised, the son of a very fancy London lawyer, positively beautiful manners but unfortunately not lifestyle habits to match! Long time since I have thought of that. 50 years ago! Mrs O, “The clap”. Haven’t heard that phrase that in a while. Such were the risks of enjoying the pleasures of the Reeperbahn in Hamburg or Grant road in Bombay. (not that I ever did, of course) But just because of the passage of time, on my first on one the first trip to Germany, went to the “Star club” (or it might have been the “Zillatal”) on the Reeperbahn and after the show had a night on the piss with some scousers playing there. They later turned out to be the Beatles, but the thing I most remember the night for was the creation of a monumental hangover. Nice Beatles memory. My b-in-law was a young Soho cop and drew the short straw – babysitting them in a locked room to protect them from fans!